I have always respected Andy Reid. There was a time when I would always give him the benefit of the doubt, but after years of seeing his deficiencies kill the Eagles on Sunday it became painfully clear that he had to go. The only problem is this became obvious a year before he was actually fired. I wish I could tell you exactly where he went wrong, because to a certain extent he was never that right. His constant desire to outsmart everyone frequently came back to bite him. He would never admit that he was wrong, even though he generically took the blame. There was a time when he was a very successful head coach and it showed, but after years of losing good coach after good coach to other teams, Reid’s deficiencies took center stage. Suddenly he couldn’t draft well, or hire decent coaches, or get those coaches to work together, or make a decision that made even a little common sense. Reid undervalued Linebackers and Safeties so much it was insulting. He personally made sure the very heart of the defense would be weak on game day and I can never forgive him for that. It was as if Reid wanted to prove to the world that he could win with short receivers, small linebackers, and worthless safeties. News flash, he couldn’t. He always seems to value character over actual talent. That notion only goes so far, because you can teach character, you can’t teach talent. Reid had no interest in putting his team in a better position to succeed as he so often claimed. How many weeks in a row did he change nothing, only to watch the house he built crumble around him? Reid wants to do things his way, even I that means losing. I will never understand how he could be so stubborn in everything he did. It’s no wonder the team stopped playing for him and the joke of a staff he had assembled. 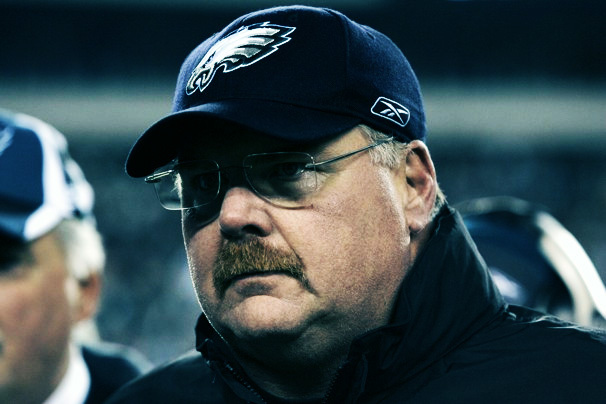 If I had to pick one thing that started the downfall of Andy Reid it was letting Brian Dawkins leave Philly in 2009. I can’t imagine Reid pounded his fist on the table to pay Dawkins more like he did for DeSean Jackson. Reid probably felt he could find another decent safety, as if another safety like Brian Dawkins just walks in off the street. A few months later the great long-time defensive coordinator for the Eagles Jim Johnson died of cancer at age 68. Both those things happened in the same offseason, it would be hard for any head coach to overcome and Reid was never one to ask for help from people around the league or retired coaches who might better advise him about defensive success. There was no clearer indication that Andy Reid had jumped the shark than his hiring of Juan Castillo to be the Defensive Coordinator simply because he felt he was “a defensive guy.” Reid tried to spoon feed that to Eagles fans with the most cheeky smile on his face, as if he was hiding the most delicious secret right behind his lips. As if that decision was a golden ticket he had finally decided to cash. To no one’s surprise it worked horribly and the nightmare that became known as the “Dream Team” crashed so hard it was almost unbelievable, but hey things couldn’t get much worse than 8-8. So hey, let’s keep all the same coaches, get rid of a few bad eggs and start the show again with a new middle Linebacker. Problem solved right? Super Bowl here we come. What do you mean 4-12 isn’t good enough to qualify for the playoffs. It turns out that Andy Reid isn’t smarter than anyone, even though he would love to think so. Andy Reid was fired and all of Eagles nation could sleep easy knowing Reid could no longer bring the Eagles franchise down. I’d like to say that I will never have to talk about Reid again, but the truth is that as the Eagles move forward without him it will become clear just how much of the Eagles past problems were directly related to Reid and his deficiencies as a coach and as a decision maker. The real test will be on game day, without Reid’s constant fumbling of big decisions and ineffective game plans, how much better will the Eagles be under the new regime? That is the question.